A server closet in the corner of an office or in a hospital may not be the first thing that comes to mind when you think about data centers, but the reality is that an enormous amount of the world's IT capacity sits in small rooms just like that. They may be small, but they have been growing in importance in recent years. Retailers put more and more IT capacity in their stores to support new digital customer experiences, while organizations like hospitals and universities are consolidating their infrastructure, meaning the footprint that’s left behind becomes more critical, according to JP Valiulis, who oversees marketing for thermal management products at Emerson Network Power. “These closets are becoming a little bit more strategically important,” he said. As such, they present a new market opportunity for Emerson, which has its Liebert cooling units installed in hundreds of thousands of these IT rooms. The opportunity is to give those existing customers a better tool to manage that infrastructure. Today, at Data Center World in New Orleans, Emerson launched a mobile app that enables remote management of small data centers. 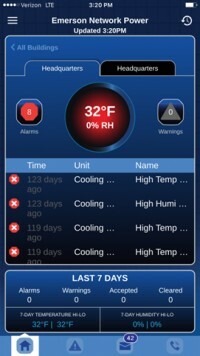 For $600 or so, you can monitor alarms, temperature, and humidity in hundreds if not thousands of IT rooms from your smartphone, and if the rooms happen to be cooled by Liebert units, you get some sophisticated monitoring capabilities specific to those units. The biggest concerns of the people overseeing this infrastructure are cooling capacity (they are hardly ever designed with accurate assessments of future IT requirements, according to Valiulis), maintenance, and monitoring. In many cases, owners of IT closets don’t have a way to monitor basic things like alarming, temperature, and humidity. The mobile app, called iCOM CMS, provides one-way communication if you’re outside your organization’s firewall, meaning it only sends you temperature, humidity, and alarm info, but you cannot make changes through the app. Once inside the firewall, however, you can do things like changing set points and reconfiguring alarm notifications remotely, as if you were standing in front of the cooling unit. The application also provides an easier-than-usual way to connect IT rooms to existing building management systems, which is typically a complicated and expensive process, according to Valiulis. The application is not currently integrated with Emerson’s big Data Center Infrastructure Management suite, called Trellis, but that integration is on the roadmap. “The data from this would be fed right into the DCIM,” he said. Another feature that’s coming in the future is the capability to collect and store operational data the application gathers and analyze it to help users make informed decisions when they are managing their distributed IT infrastructure.